The Bayside Place Hakata Pier is the marine terminal for the regular service ferries for Tsushima island, and also for chartered cruise boats. Inside the fashionable terminal building are many restaurants and boutiques and, above all, the gigantic 8 m tall "Aquarium", which keeps some 1200 fishes, attracts the attention of the visitors. In the evening, a bay side show takes place, using fountains and laser beams. Visitors from every corner of the country never miss it. There are 2 cruise ship terminals in the Hakata Port. One is Fukuoka Chuo Wharf and another is Fukuoka Hakozaki Wharf. More port development is aimed at attracting additional large ships. The city has dredged and lengthen the Chuo Wharf in 2018 in line with specs for Oasis-class vessels. Now the berth at Chuo to accommodate two vessels at once. Chuo Wharf, where most cruise ships dock, is not in walking distance to Bayside Place or the city center. Taxi to city center about 2000 yen. Fukuoka City was once a city divided by a river. Hakata was a port town for merchants, while Fukuoka was a castle town for samurai. Time fused the two together and although Fukuoka is the official name, Hakata is the name, most Japanese know it as. Because of its closeness to the Asian mainland (closer to Seoul than to Tokyo), Fukuoka has been an important harbor city for many centuries and was chosen by the Mongol invasion forces as their landing point in the 12th century. Today's Fukuoka is the product of the fusion of two cities in the year 1889, when the port city of Hakata and the former castle town of Fukuoka were united into one city called Fukuoka. Hakata remains the name of Fukuoka's central district and main railway station. While still a big modern city, it's not hard to get around. 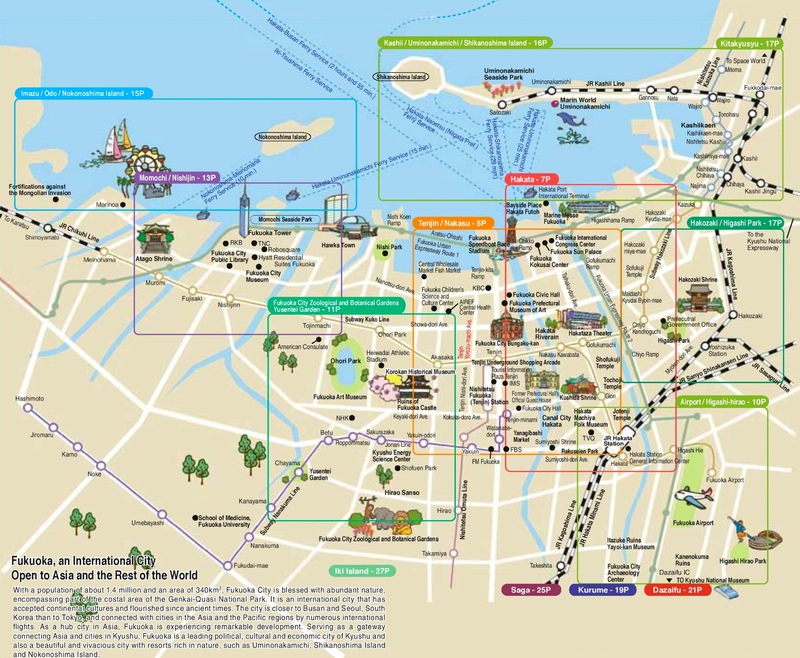 A subway connects most of the city's main attractions, taking in Hakata, Tenjin, Fukuoka International Airport, Meinohama (where Asia's 2nd largest Ferris wheel is located) and Nishijin (where you can find Fukuoka Tower and the baseball ground of the Softbank Hawks: Fukuoka Yahoo! Dome). The main station in Hakata also marks the terminus of the famous Shinkansen bullet train. The city is small and compact enough to wander around on foot. Fukuoka Tourist City Pass is one-day pass which gives foreign tourists unlimited rides on buses and trains operating in Fukuoka City. If you do not speak Japanese or your destination is not a well known place, it is recommended to give your driver the precise address of your destination on a piece of paper or, even better, point it out on a map, since the Japanese address system can be confusing even to local taxi drivers. Dazaifu - a site of pilgrimage every new year for Japanese students, this small town houses the beautiful Dazaifu Tenmangu Shrine (dedicated to a Shinto deity of learning) and the recently built National Museum (Kyushu). Tenjin is Fukuoka's largest shopping district, with an abundance of designer stores housed in towering retail blocks such as Tenjin Core, IMS, Vivre, and Underground. There are plentiful boutique areas, including Tenjin Chikagai which is housed in a pleasant underground area adjacent to the Tenjin subway station. Nishi-Dori and Oyafuko-Dori (actually the same street, separated by Showa-Dori) contain a multitude of stores and restaurants, both mainstream and independent. A uniquely designed mall called Canal City, which houses many kinds of clothing stores, restaurants, rare character shops - including a Studio Ghibli goods shop - and even a well-appointed theater, is located midway between Tenjin and Hakata in the Nakasu entertainment district. If you have time, be sure to catch one of the hourly fountains shows held in the center of the bowl-shaped complex. Fukuoka City provides a free public wireless LAN service known as "Fukuoka City Wi-Fi" for everyone, also in the cruise terminal.